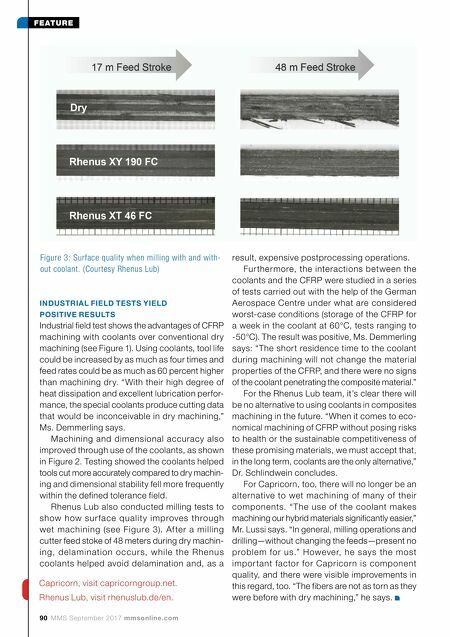 90 MMS September 2017 mmsonline.com FEATURE INDUSTRIAL FIELD TESTS YIELD POSITIVE RESULTS Industrial field test shows the advantages of CFRP machining with coolants over conventional dry machining (see Figure 1). Using coolants, tool life could be increased by as much as four times and feed rates could be as much as 60 percent higher than machining dry. "With their high degree of heat dissipation and excellent lubrication perfor- mance, the special coolants produce cutting data that would be inconceivable in dry machining," Ms. Demmerling says. Machining and dimensional accuracy also improved through use of the coolants, as shown in Figure 2. Testing showed the coolants helped tools cut more accurately compared to dry machin- ing and dimensional stability fell more frequently within the defined tolerance field. Rhenus Lub also conducted milling tests to show how sur face qualit y improve s through wet machining (see Figure 3). Af ter a milling cutter feed stoke of 48 meters during dry machin- ing, d e l a minatio n o c cu r s, w hil e th e R h e nu s coolants helped avoid delamination and, as a result, expensive postprocessing operations. Fur thermore, the interactions between the coolants and the CFRP were studied in a series of tests carried out with the help of the German Aerospace Centre under what are considered worst-case conditions (storage of the CFRP for a week in the coolant at 60°C, tests ranging to -50°C). The result was positive, Ms. Demmerling says: "The short residence time to the coolant during machining will not change the material properties of the CFRP, and there were no signs of the coolant penetrating the composite material." For the Rhenus Lub team, it's clear there will be no alternative to using coolants in composites machining in the future. "When it comes to eco- nomical machining of CFRP without posing risks to health or the sustainable competitiveness of these promising materials, we must accept that, in the long term, coolants are the only alternative," Dr. Schlindwein concludes. For Capricorn, too, there will no longer be an alternative to wet machining of many of their components. "The use of the coolant makes machining our hybrid materials significantly easier," Mr. Lussi says. 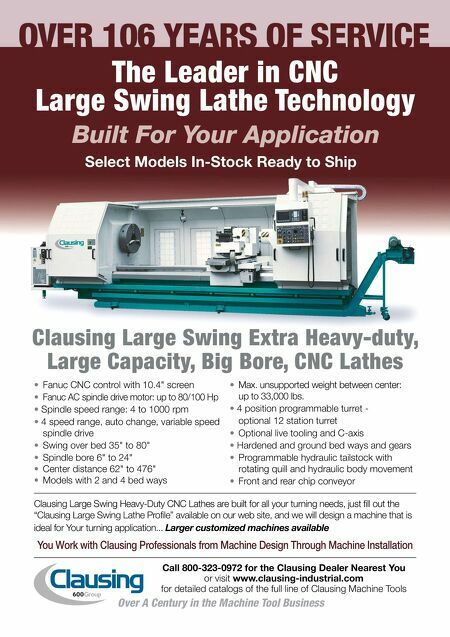 "In general, milling operations and drilling—without changing the feeds—present no problem for us." However, he says the most impor tant factor for Capricorn is component quality, and there were visible improvements in this regard, too. "The fibers are not as torn as they were before with dry machining," he says. Figure 3: Surface quality when milling with and with- out coolant. (Courtesy Rhenus Lub) Capricorn, visit capricorngroup.net. Rhenus Lub, visit rhenuslub.de/en.